Today Holy Mother Church also celebrates the feast day of St. Joseph Cafasso. Cafasso met St. John Bosco when Bosco was 12 and when he, Cafasso, was a seminarian very involved in the work of the parish. Just look at that photo: he looks like a saint! But I won’t stop blogging there. There’s more to say. Cafasso was ordained a priest in 1833 and began working as a theology professor in a seminary. He was very well loved. Many reflections conclude from Cafasso’s life that he was a man who believed immensely in the gentle mercy of God, which impelled him to a ministry of priestly service characterized most by gentle love and mercy. This drew others to him. There’s a great lesson in that. St. John Bosco is one such man who was drawn to this saint. Cafasso was Bosco’s spiritual adviser, and Bosco credited him as the man who helped in a profound way his discernment, which led him to receive the vocation of working with boys. 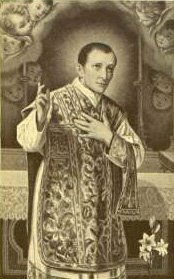 St. Joseph Cafasso: Pray for us!